There are many reasons why someone would consider owning and shooting a pellet rifle. These guns are great for small game and pest control around your property. When it comes to owning and operating one of these guns, it is important to consider your needs. For someone hoping to hunt small game it is important to be accurate with the shot. You are out to hit your target and need every chance at making that happen. If your goal is to knock out pests around your property you really don’t want to miss the shot. A proper scope can help you to make the most of the pellet gun regardless of your intended use. When it comes to scopes it is important to know what you are talking about. You need to know how a scope operates so you can get a better idea of what you need for your specific purpose. The standard pellet gun scope has two lenses. The first is the ocular lens, and the second is the objective lens. The ocular lens is the one that faces you that you look into before firing, and the objective lens is the portion that faces away from you. When looking at lenses they will list the magnification as 4×32 or something similar. The first number is referring to the ocular lens, and the second number is referring to the objective lens. You can have fixed or adjustable scopes. The fixed scope will contain just the one number, and the adjustable scope will list a range of numbers. For example, 4×32 is an example of a fixed scope, and 4-9×32 is an example of an adjustable scope. You also need to select your crosshair style when it comes to the scope. Some of the styles will depend on personal preference and also on what you are hoping to shoot. The two most common styles are fine crosshairs and duplex crosshairs. The fine crosshair doesn’t cover much of the target but can also blend into a dark background. The duplex crosshair is more pronounced and is the crosshair of choice for most enthusiasts. This stems from the fact that its bold lines allow greater visibility even against a dark or crowded background. It is important to note that there are differences between pellet gun scopes and scopes designed for standard firearms. Pellet guns tend to have more recoil and they need a scope that is designed to handle that additional vibration. A good way to ruin an expensive firearm scope is to use it on your pellet gun. So again, when you are using a scope it is important that the scope fits your gun and intended purpose. The final important point to consider is your budget. A scope can easily balloon in price depending on what you are looking for it to do. It is important to have an idea on your purpose and your budget when you begin shopping. This will allow you to get the best bang for your buck and get a scope that is truly functional for your needs. UTG produces a great budget scope. The UTG 4×32 1” hunter scope is a fixed magnification scope. It is a fairly simple scope that is incredibly reliable for the price. It stays calibrated incredibly well. Once you get zeroed in you likely won’t have to touch it. It handles the recoil of the gun very well. It is nitrogen filled and completely sealed. It is fog proof and rain proof so you can take it out in any condition. It also has a mil-dot range estimator which allows you to properly decide if the shot is worth taking. This scope does come with rings to mount it, but you may decide to purchase higher quality rings. Another great scope worth looking at is the Simmons 511039 9×32 scope. This is a scope that is certainly budget friendly. Budget friendly doesn’t have to mean poor quality. Simmons doesn’t skimp on features for this scope. It has great reviews on Amazon and is certainly worth looking into. It has a single tube construction that allows for greater durability. There are also rubber coatings on the knobs. This is a thoughtful feature that will allow for easy adjustments under a variety of conditions. It has parallax correction which will greatly help with accuracy from a distance. It also has special coatings on the lens to ensure a nice clear shot every time. It is also water proof, fog proof, and will hold up well to the recoil of repeated shooting. You aren’t going to have to find zero repeatedly with this model. As with others, this scope comes with mounting rings so you should be good to go right out of the box. It is hard to talk about all of these lenses and scopes without at least mentioning something from Nikon. The Nikon P-223 3-9×40 BDC 600 is a powerful and versatile scope. It is in a higher spending category than the Simmons 511039 or the UTG. Naturally more features will mean a higher price. This scope is also found on Amazon and has 649 reviews with an average 5/5 star rating. That is phenomenal customer satisfaction. While reading further about this scope it became quickly apparent why it is a hit with consumers. This scope boasts a 100-yard parallax setting which is said to eliminate parallax entirely. This allows for precise shooting every time. (The parallax effect is an effect where the target can shift based on how it is being viewed in the scope. If you place a cup on the table and close your right eye the cup looks clear and normal. Close your left eye and alternate back and forth between right and left. What happens? The cup seems to shift back and forth on the table. This is parallax, and this is what a good scope is designed to reduce or eliminate.) It has a zero-reset turret which will maintain adjustments even with repeated shooting. This scope is sealed and nitrogen filled. It is fog proof and water proof. The versatile magnification range allows you to easily adjust this scope for a variety of shooting situations and distances. It also has the ability to zero in on your precise ammunition and recoil. Just about everything is customizable with this scope. Next up we have the Hammers 3-9×32. This is an incredibly clear scope with great optics. The adjustable magnification allows this scope to be used in a variety of shooting situations. The scope itself is lightweight aluminum that is scratch resistant. It is also fog proof and water proof so come rain or snow you will be set. The strong point of this scope is the internal fortification. This allows the scope to stay zeroed even on the most jarring air rifle. 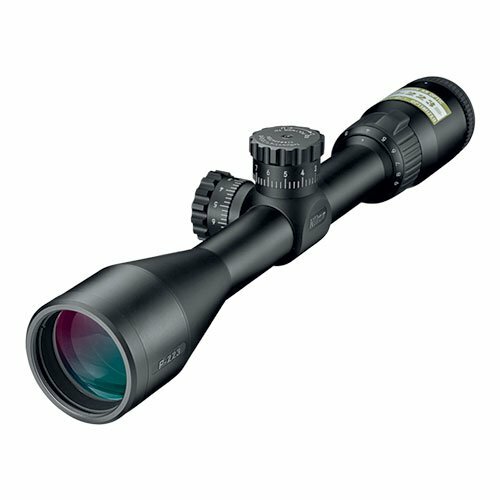 The Aipai C3-9x32EG is another scope that makes the list. This scope comes in a package deal on Amazon. It has a green laser sight that you can attach and detach. The laser is overkill but it is useful when trying to site the rifle and also for pest control. It is fun to see the target light up right before you fire. This scope is one you can easily customize. You can add and remove options at will. If you feel you don’t need the laser sight just remove it. The magnification is great and will add increased range and ability to most shots. It is shock proof, and it will withstand most recoils without needing to be recalibrated. It is also water proof and fog proof. The lenses are clear and visibility is high. All of the inclusions, in the package deal, make this a scope worth considering. Trying to determine the best scope may be like asking a parent who their favorite child is. It is a nearly impossible question to answer. The winner from our list is the Nikon P-223 3-9×40 BDC 600. It simply doesn’t get much better than this. Nikon has long been known for their optics and produces great lenses with a longstanding reputation. The quality is unmatched. The runner up is the UTG scope we talked about at the beginning of the article. This scope is surprisingly feature rich for the price. If you don’t want to spring for the Nikon, then the UTG will not hang you out to dry. Third place is awarded to the Aipai C3-9x32EG. This is a fun scope with a lot of extras. They make it entirely worth the increased cost. The laser site is fun to mess around with. The scope itself is incredibly accurate and clear in most conditions. Whether you are hunting or on the range this is worth consideration. So remember, when looking for a scope it is important to know what you are looking for. What are your intended uses. Once you have determined those it is important to identify the budget. Once a budget and your needs have been determined you should then review this list and see what matches up against your needs. These scopes will help you get the most out of your pellet rifle, and honestly there isn’t a bad pick in the bunch.